Sword dueling certainly didn’t begin as a sport, but the elements of art, culture and circumstance it brings cannot be ignored. The foil sword is notable for its lightweight, flexible frame, consisting of a guard, grip, and a pronged, tapered-steel blade. The blade is specifically modeled to bend easily (this to prevent injury and the shaft breaking during play). The length of the foil hovers closely around 90 cm and the weight of it cannot exceed 500 grams. A key difference in all fencing weapons compared to real-life swords is the “button” that replaces the tip of the blade. Aside from the blade itself, the most prominent component of the foil is the button assembly. Foils are modeled in both electric and nonelectric varieties. A judge is necessary in distributing points during a nonelectric foil match, but with electric foils, the tip registers contact electronically and points are distributed based on the validity of the hit. Ever-improving technology, when combined with sports, can be either a hit or miss. Modern fencing is often heavily-assisted by technology, but this tends to enhance the experience of it as a sport. French for “sword”, this weapon is the largest of the 3 fencing sword variants and also weighs the most. Notable differences from the foil (in both weapon design and game format) include the implementation of a stiffer blade design (though it remains flexible enough to preserve safety) that, unlike the rectangular foil and sabre, is triangularly cut. The bell guard of an épée is also more pronounced than its counterparts. Contrary to other competitive categories, when épée fencing, the entire body of each player may be tagged fairly, including the limbs. 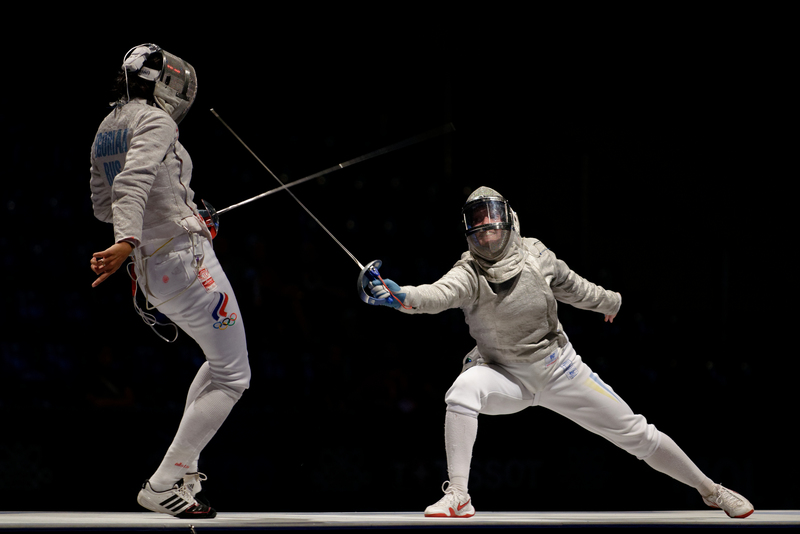 The nature of this fencing genre lends it to be slightly more lax on aggressive play, as players are expected to work much more diligently in landing and avoiding hits. Indeed, épée fencing, in regulations and play, most closely resembles classical sword dueling of the 1800s. Sabre, or saber fencing involves slightly altered rules and another unique sword design. The blade of a sabre is relatable to an épée, although it is not as stiff. The target area in sabre fencing is above the waist up, similar to foil fencing. However, instead of restricting legal hits to the torso only, sabre fencing usually permits strikes on the hands and head as well (though not hands). The most prominent difference in sabre fencing play deals with landing the hits themselves – firstly, it is noteworthy that the sword utilized has no button on its tip to track points from successful hits. Rather, the entire blade is valid for delivering strikes against players. Due to this exceptional mechanic, sabres that function electrically are preferable, and tracking hits is made easy by a current delivered from the sword through the opposing player’s fencing gear. A graphical overview of the differences in each fencing genre’s weapon design and valid target locations. It should come as no surprise that fencing began not as a sport, but as a military training exercise. In an era where swords dominated the battlefield as an effective weapon of choice, sparring between aspiring swordsmen was a crucial part of military training and skill development. Unassisted by fancy electrical equipment and specially designed weaponry, duelists would engage each other to refine their abilities and, with any luck, get an opportunity to test their mettle in the field. Changing times aided fencing in its transition from applied combat to recreational/competitive sporting activity. 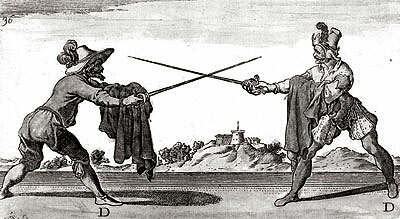 Sword dueling moved from military environments to fencing schools and academies amid Europe in the 1700s. Across the next couple of centuries, techniques, rules, and other elements that pool into creating a wholesome sport began to manifest. Today, fencing is internationally renowned and celebrated as one of several combat-oriented competitive sporting activities. This entry was posted in Fitness/Wellness, Olympics, Other and tagged Combat sports, Fencing, fencing history, sport, sports, sports and fitness, sports and leisure, sports and recreation, sports and training, Sports Archives, Sports Blogs, sports history, sports performance, sword fight, sword sports, swordsmanship. Bookmark the permalink.